This is the title page of Thomas Clarkson's 'The History, Rise, Progress and Accomplishment of the Abolition of the African Slave Trade by the British Parliament.' Clarkson was one of the leading British campaigners against slavery and published a number of pamphlets and essays on the subject. 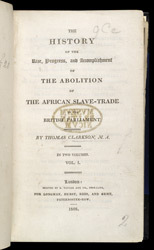 In 1807 the Act for the Abolition of the Slave Trade was passed but Clarkson argued that the legislation had not gone far enough.